Are you tired of sitting close to your smoker all day long because of your time consuming meat or turkey BBQ? This definitely comes to an end the moment you discover what Maverick ET-733 black long range meat thermometer review has for you. Because of the lasting reputation it has set forth, we should always trust Maverick ET-733 for its great products. Our analysis featured most on the number of features included in the set of this wireless meat thermometer. Then we went ahead to examine how each and every feature is designed to function. This is how we arrived on the conclusion that this Maverick ET-733 Long Range Wireless Dual Probe BBQ Smoker Meat Thermometer Set is a worth buying product. The fact that this product comes from Maverick is sufficient fact that it is not going to let you down. We understand that your needs are more important and that paying for a money worth product is what you are looking for. This is a money-worth product from Maverick, owing to its top position in the market of probe thermometers. Therefore, the product is absolutely genuine. And the price at which it sells is a great bargain and a source of discount to you. We have done a close comparison with other similar models from the Maverick and other brands. Our findings have revealed an utmost regard to consumer needs as far this Maverick product is concerned. Product dimensions: 12 x 3 x 8 inches. 1359 customer reviews and its increasing. When you are set to invest your resources in this unit, expect a number of benefits resulting from its integrated features. From its new larger back-lit screen to a wide variety of programmed meat types, you will have your dreams fulfilled. The back-lit screen is large enough to read even from a considerable distance. You will also find two hybrid probes which allow you to monitor and manage two BBQs at ago. Similarly, you can monitor one food and one BBQ or two foods simultaneously. Depending on your individual desires and preferences, you are sure to at least find and option to go by. There are 15 types of preset meat choices from which you simply can choose from. And the whole process is simple and stress-free, for the easier controls are designed to perform everything for you. Additionally, if your lawn is big, worry less. You can walk around attending to other tasks as you cook without compromising your expectations. This probe thermometer allows for easy monitoring of your cooking temperature up to 300 feet away. Using this unit is quite easy. To raise the temperature setting, simply press H. If you want to lower the temperature, press LO. Courtesy of audio alarm, you will receive a prompt alert immediately your food is cooked to your preset doneness level. You can also choose between low alert range to high alert range. This depends on your specific type of cooking or BBQ. In so doing, you have an option of using either Celsius mode or Fahrenheit, which makes it a friendly, customizable and convenient unit. 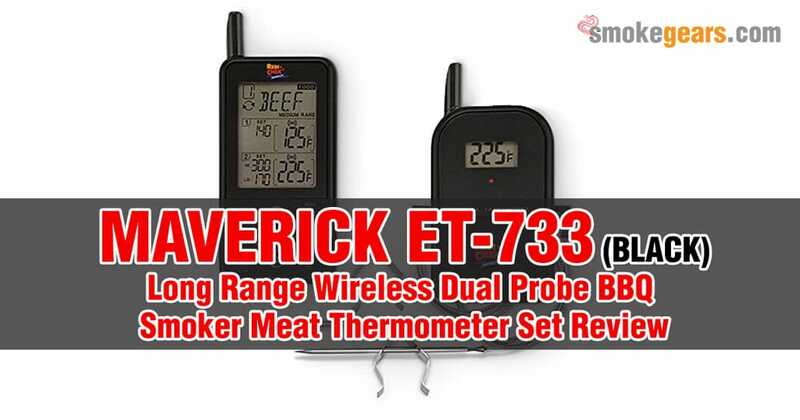 Who is Maverick ET-733 Dual Probe BBQ Meat Thermometer for? If you like smoking, cooking or grilling meat or any other delicacy, you are a potential user of this equipment. Maverick ET-733 Black model of probe thermometer is meant for everyone seeking comfort and convenience. Maverick ET-733 Black model of smoker thermometer serves all categories of users, more so the enthusiasts of cooking and smoking. Are you working in restaurant or you would like to improve your cooking or grilling results at home? This Maverick digital kitchen equipment is here to transform your experience to a totally new level. As we have already stated, this product has extensively been reviewed, always attracting positive comments from the previous consumers. As portrayed by its above-average rating, we are confident to conclude that this is highly functional kitchen equipment. We do not just trust empty words because we understand that is where scammers find an opportunity. So we wanted to have a first-hand experience with this maverick probe thermometer before recommending it to you. After our long trail way of research, nowhere along the way did we witness a despise of the product. As our trust in the product gradually grew, so we continued to prove day by day that this is truly an efficient product. We committed to regular comparison of this model with others. For sure, the features and functionality of this maverick product supersedes other models by far. The screen is large enough to view at a distance. Easy-to-use controls make everything easier. It is relatively cost effective compared to other similar models. Trusted model due to a high number of customer reviews. It is difficult to recover your previous settings in case the probe thermometer goes off. Design has limited portability compared to other models from Maverick. The set does not have BBQ gloves like other Maverick models. Needless to say, this wireless thermometer from Maverick is an indisputably high quality and trusted equipment. It has attracted the confidence of more consumers than most similar equipment. Its simplicity is what makes it an ultimate choice for users. It conforms to the multiple user-needs and has quite efficient and functional features. Our utmost applause goes to its great design, featuring large enough and visible screen. As a user, all your needs are catered for. Although it differs significantly with other similar probe thermometers, all the essential features are covered. So buying this equipment will never turn into regrets. Instead, spending a few resources on it saves you from uncertainties of cooking, grilling and smoking.